Enter H5C’s I Love My Valentine Contest! February is here and you know what that means… Valentine’s Day is right around the corner! Bring on the candy hearts, red, pink and white decorations and Valentine’s Day Cards! 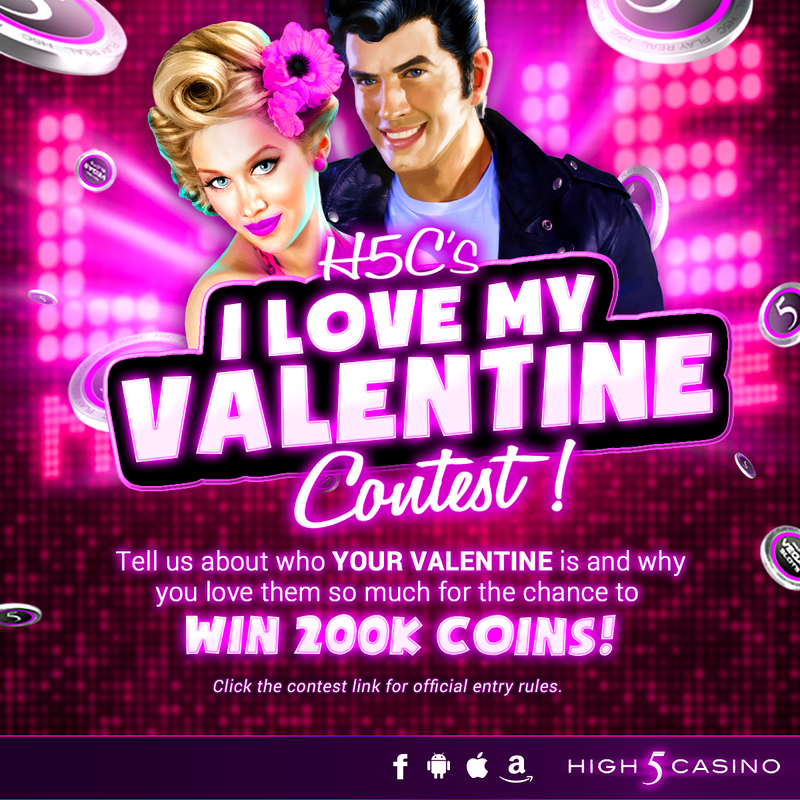 With it almost time to celebrate the season of red roses and heart shaped chocolate boxes, enter High 5 Casino’s I Love my Valentine Contest for a chance to win 200k coins! Roses are red. Violets are blue. We want to know more about you! Tell us about who you will spend Valentine’s Day with and why you love them so much in at least 2 sentences. Contest ends Monday, February 13th, 2017 at 11:59pm EST. Submit an entry for the chance to win 200K coins. Winners will be announced on Tuesday, February 14th in celebration of the special day. Sam- My Valentine this year will be my husband. Some say laughter is the best medicine and my husband always knows how to make me laugh even on the worst of days. We’ve been together going on 5 years and he makes every day the best day of my life. Jay- My Valentine this year is someone very special to me. She is an important person in my life. She is always down to watch super hero movies with me and that’s only one of the reasons I like her so much! Kal- My Valentine is someone who makes me smile and laugh every single day. He is my biggest supporter and my best friend. Enter the contest now and let us know why you love your valentine! Comment in the conversation bubble below and let us know what type of contest you would like to see in the future. This entry was posted in High 5 Casino, I Love My Valentine Contest and tagged Android, App Store, Apple, contest, Facebook, free coins, Free Games, H5C, High 5 Casino, High 5 Casino Mobile, High 5 Games, I Love My Valentine, iOS, iPad, iPads, iPhone, iPhones, Love, mobile gaming, promotion, slots, social gaming, Valentine's Day by hoothigh5. Bookmark the permalink. I love Valentine’s Day, but love High 5 more!!!! My valentine is my daughter. She takes care of me and has my back no matter what. She can sense when i need anything and makes sure I get it. I love her more than anything.